Publication details: Book. 2017. 40 pages. Publication date: 2017-01-17. Glaucoma in children is a potentially disabling disease: early diagnosis and treatment can minimize the visual impairment. The assessment and treatment of a child with glaucoma can be challenging and there is a need for standardization for diagnosis and treatment of these children. 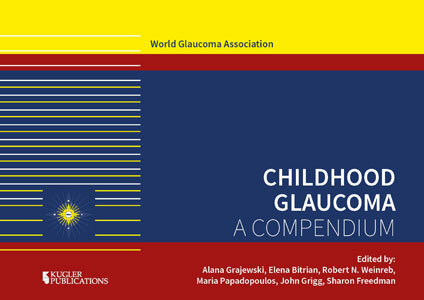 The World Glaucoma Association Consensus Series 9 represents a collected wisdom from experienced pediatric glaucoma practitioners worldwide. Most, if not all of the contributors in this Consensus, are members of the worldwide collaboration of pediatric glaucoma specialist: Childhood Glaucoma Research Network (CGRN). The purpose of this publication is to collect in a visual and practical format useful content from the Consensus Series 9 book. The algorithms here represent a reasonable approach to the classification, diagnosis, and treatment of childhood glaucoma. This is not an attempt to establish a standard of care, rather the “roadmaps” in this book are reasonable guidelines to assist the physician who finds themselves in the situation of caring for a child with glaucoma. It is our hope this abbreviation of the Consensus Series 9 on Childhood Glaucoma will be of value to you in the long road of your care of these small and precious patients.